Alfonso Wenker is a dynamic, engaging, practical and highly sought-after trainer and facilitator. His work as Principal at Team Dynamics focuses on strategy development, diversity, equity and inclusion, team building, leadership development, and self-awareness. Alfonso’s organizational homes have included Bush Foundation, Minnesotans United for All Families, and PFund Foundation. He recently completed his tenure as the vice president at the Minnesota Council on Foundations—which has more than 180 member organizations. In that capacity, he served as the lead trainer for the Council’s professional development programs, consulted with leaders and organizations interested in advancing equity and inclusion, and led internal organizational development. 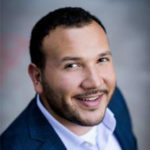 Alfonso currently serves as the board chair of Pollen Midwest and serves on the leadership teams for Solidarity MN and the BEtter OUTcomes Initiative, two funder collaboratives focused on advancing equity in Minnesota.